A revised version of the Graham-Cassidy plan would give more federal funds to the states of key Senate holdouts, like Sen. John McCain of Arizona. Republican lawmakers revised their latest plan to repeal and replace Obamacare in what appears to be an attempt to win some much-needed Senate votes. Sens. 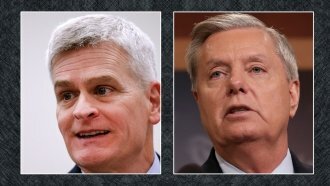 John McCain and Rand Paul have already said they'll vote against the Graham-Cassidy-Heller-Johnson plan, which would end Obamacare's Medicaid expansion and would replace insurance subsidies with block grants; states could spend those chunks of money how they see fit. Republicans can't afford to lose any more votes, so the plan's authors now seem to be targeting states whose senators are possible "no" votes. Sen. Lisa Murkowski from Alaska is one of those targets. A provision was added that would give extra money to "high-spending low-density" states. So between 2020 and 2026, Alaska would receive an estimated 3 percent more health care funding compared to current law. And Sen. Susan Collins' home state of Maine would receive an estimated 43 percent more health care funding. Collins previously said she was "leaning no" on the Graham-Cassidy plan. According to estimates, Arizona would receive 14 percent more funds, and Kentucky would receive a 4 percent increase. McCain represents Arizona, and Paul represents Kentucky. McCain, Collins and Murkowski were the three Republican "no" votes that halted a previous attempt by the GOP to repeal some parts of Obamacare in July. Because of current Senate rules, the GOP has until Sept. 30 to pass health care reform legislation with a simple majority vote.